Italians are a proud people. They are proud of their delicious pastas and wines, their fashion sense, but most certainly also of the most important and most often played lottery of the country: SuperEnalotto. This lottery has been very popular within the country itself because of the high jackpot. In 2010, a new Italian jackpot record was established with a staggering amount of 177.8 million euros. This will undoubtedly be broken at some point in the near future. As it stands, there is no maximum amount in SuperEnalotto. Therefore, you can truly make all of your dreams come true if you win the increasingly growing jackpot of this Italian lottery. On December 3, 1997, the time had come: the first draw of the Italian SuperEnalotto. Although this lottery was not completely new at the time. SuperEnalotto was actually some kind of new and improved version of the Enalotto. And this lottery has been played since the fifties. In the first years of the SuperEnalotto, the numbers were taken from draws of regional lotteries. The first number drawn was selected from the lotteries in Rome, Milan, Napels, Palermo, Florence and Bari. Simple as that. Besides, the lottery from Venice provided an additional bonus number. Together, those numbers formed the results of the SuperEnalotto. This system was changed in the summer of 2009. Ever since, SuperEnalotto has been a truly independent lottery, that players from all around the world are eager to take part in. 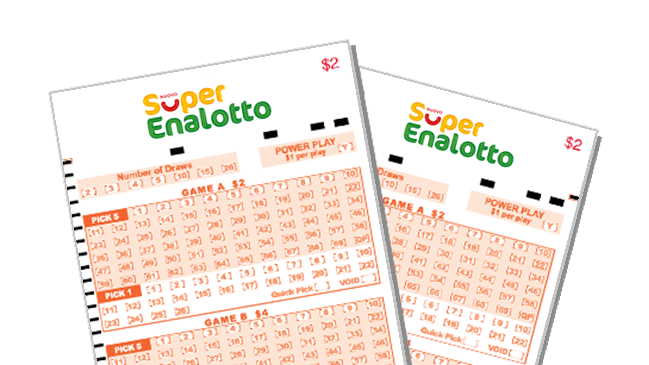 The most important lottery of Italy used to be Enalotto, but it recently shifted to the SuperEnalotto. Additionally, a new way of determining the relevant numbers was introduced. Despite all of those changes, the basic principle of the game has always remained the same. Using a lottery ticket with 90 numbers, you eventually get to select 6. For this, you can use your own lucky numbers or opt for the so-called quick pick. With this option, the numbers are filled in automatically. This is perfect if you happen to lack inspiration. With the Italian SuperEnalotto, you never have to wait long for the drawing. Because while many lotteries organise drawings once or twice per week, SuperEnalotto has three. The drawings take place every Tuesday, Thursday and Saturday at 8pm. If you take part, you will have a shot at winning prizes in 6 different categories. One of those is obviously the jackpot. But even if you only get 2 numbers right, you already win a prize with SuperEnalotto. Popular lotteries such as SuperEnalotto always have a loyal group of players. And these players often do more than simply trust their gut instinct and select a couple of numbers. Although it is a mere coincidence which numbers will drop, you can still make an analysis based on drawings from the past. These are the so-called ‘hot’ and ‘cold’ numbers. SuperEnalotto players are fervently keeping track of the draws in tables. These show which numbers drop often (the hot numbers) and which barely do (the cold numbers). These tables will teach you something about the draws in a specific year. In 2016, the hottest numbers were 1, 55, 77, 85, 86 and 90. The coldest numbers were 5, 9, 28, 50, 59 and 60. Yet the most and least drawn numbers from the past obviously do not say anything about this moment. This is why there are also tables that keep track of the last 20 or 50 draws. This obviously forms a piece of very interesting information. You might wonder how to use those hot and cold numbers of SuperEnalotto. In fact, this is very personal. There are players who assume that the hot numbers are likely to return in upcoming drawings. Yet there are other players who base their strategy on the opposing idea. Because if a number has not dropped for 10 or even 20 times, the moment has to arrive for this ball to eventually roll out of the machine. The only question is when this will happen. For instance, the number 45 has once gone for 100 drawings without dropping. So, no matter how much players of SuperEnalotto want these hot and cold numbers to lead them to a solid win, it will always remain a matter of luck. A standard lottery ticket of SuperEnalotto contains 90 numbers. With this lottery ticket, you can already win some pretty decent prizes. But for a small surcharge, you get to choose a SuperStar number alongside the 6 regular numbers. If you happen to win the jackpot, this amount will be increased by 2 million euros. Yet you do not only profit from the SuperStar number when winning the jackpot. The value of the remaining prize categories can be 25 or 100 times higher than they are for the original SuperEnalotto drawing. In order to qualify for this additional cash prize, you will have to correctly predict that one number (the SuperStar). Since there are 90 numbers for you to choose from, this is quite a task. Luck could, however, be on your side. Every time that the jackpot is not paid out, the maximum amount that can be won increases. This is the case for pretty much all lotteries, although SuperEnalotto does not have a maximum. And this is quite unique in the world of lotteries. The jackpot always starts at 1.3 million euros. With three drawings per week, this amount is bound to increase sharply. The Italian SuperEnalotto is known for its long rollover period. This is the time that it takes for the jackpot to drop. It took some 9 months for the record amount of 177.8 million euros to eventually see a winning combination roll out of the machine. Because of this long period and the rapidly increasing prize money, the lotto is highly anticipated, with excitement rising after each drawing. This is not only palpable in Italy, but also in other countries. Because who would not want to have a shot at winning a jackpot of more than 100 million euros? Thankfully, you can now take part in the Italian SuperEnalotto from every country in the world. You can simply do so through an online intermediary such as theLotter. You take part using an official lottery ticket, so you have the same odds of winning as the Italians themselves. Ready to win the SuperEnalotto? The Italian SuperEnalotto is a popular lottery from Italy that is held three times per week. The SuperEnalotto is known for its sizeable jackpots, that have in the past gone up to an amount of €177 million. So, rather significant cash prizes! Would you like to take part in the Italian SuperEnalotto? As a limited time offer, we can give you a 15% discount through Lotten.com when you take part in 5 draws through theLotter. Click on the button below to get your discount on lottery tickets! Get your SuperEnalotto tickets here!